ICON TWO GALLON SET Glamorous Wash Fine Laundry Detergent by Tyler Candles ICON is an invigorating, fresh fragrance as legendary as the leading man who wears it! Spicy, sporty, original, and truly unforgettable! Notes of sandalwood blend with ambergris, violet leaves, French verbena, and Florentine iris to create the ultimate aroma sensory experience! 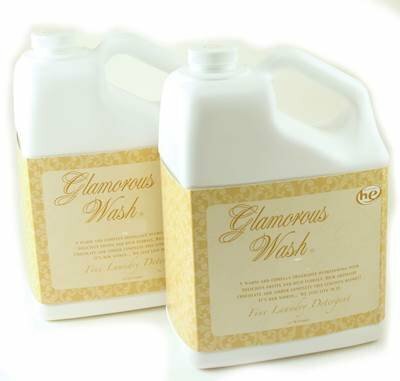 All Tyler Glamorous Wash Laundry Detergent is "he" for high efficiency washers. Some bottles have labels without the "he" mark because Tyler is using up stocks of labels printed before the "he" conversion. Try All of Tyler Candles' fragranced products including: Scented Jar Candles, Mixer Melts, Room Sprays, Fragrance Lamp Oils, Reed Diffuser Oils, Hand Lotion, Hand Wash, Glamorous Wash Laundry Detergent, Sachets/Dryer Sheets, Faux Flame Perfumers and Autoglam Diffusers for your car!